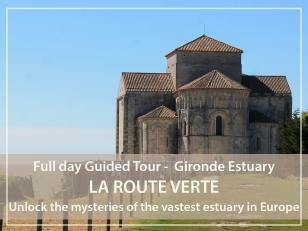 Between vines, cliffs and picturesque villages : The Route Verte is a touristic itinerary runs along the Gironde estuary. We will discover superb panoramas, small anecdotes & rich history and the specifics of this natural environment. We will meet on a fixed meeting point out of the highway for travelling together along the Gironde estuary. We can use your own coach or use your cars, the guide being in the first vehicle (6 vehicles maximum) to drive along the Route verte : A very picturesque route along the Gironde estuary.